Both of these are available new (as-of 06/15), though as I was experimenting, I got them used off E-bay for $20-$25. V65: These adaptations make use of the V45/700 PG mounting blocks. These will bolt on to the V65. Which is better? Both work equally well as pulse generators and are close to the original's resistance of 480 ohms. It is a question of which you think will be easier to adapt. I have tried to note all of the things that need to be done for each so you can get an idea. Alignment: Use the old PGs for setting the alignment of the new ones. Turn crank so an edge of the starter clutch bump is centered on the old PG metal pick-up. 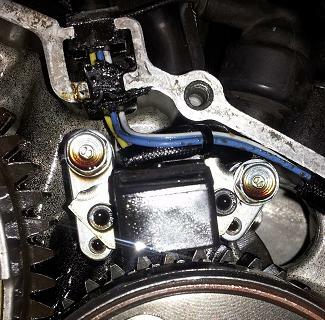 Put reference marks somewhere, such as tape on the primary drive gear or flywheel (opposite side of engine) and engine case, as once the original PG is removed from it's mounting block, the original alignment is lost. - Notch in the PG mounting block to clear where the wires exit the PG will need to be widen just a bit. - Use cap head bolts for extra clearance. Can grind down the outside of the head if you still need some more clearance. - When locating the PG mounting bolts, leave a little room between the bolt head and PG body, so the PG can be shifted side to side for aligning. - When installing, slot the PG mounting bolts holes as needed to center the PG on the starter clutch bump and set the air gap to .020-.025". If you are having trouble getting it moved to the side, the notch in the mounting block for the PG wires may need to be widen some more (or grind the PG here a bit - just don't get into the wires). - When drilling new PG mounting holes in PG mounting block, they may come out the back on a step edge. 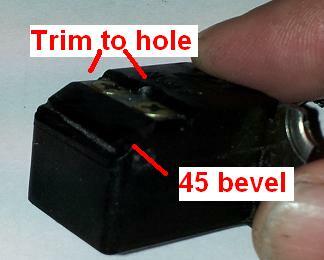 Stop when drill first breaks out, and then use a dremel to make a notch to clear PG mounting screw. 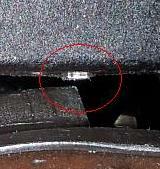 When reinstalling engine cover, check it is not hitting on the PG's. Just before the cover alignment dowels engage, move the cover a bit up/down and left/right to get a feel that is some clearence and it will not be in contact with the PG's when installed. If you are not sure or feel that is going to be hitting, then check with clay to see where to grind further. 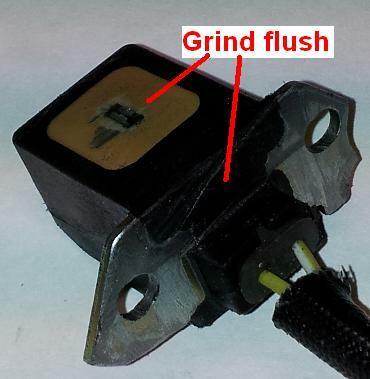 Grind down the metal pick-up on the face so it is flush. While the PG sits in the engine and will see temperature of 200 F plus, I would be cautious about getting it too hot when grinding. Stop and cool with water, keeping it below boiling. 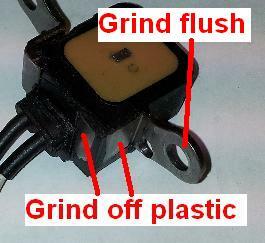 Grinding can leave a burr that then smears out the shape of the metal pick-up. As needed, clean up the edges with a dremel, grinding in towards the center so the edges are crisp and sharp. Don't grind down into the plastic face, as there is a coil of wire is just below the surface. Grind plastic off PG base so it can sit flat on the mounting block. Grind plastic off top back to hole as shown - just down to the metal. Grind a bevel as shown. You are grinding into metal here. Again don't get it too hot. Can check cover clearance with clay later if it still hits. Trim off PG bracket original mounting holes and grind down flush any remaining locating collar on bracket back. Position new PG - check and grind PG bracket as needed to clear PG mounting block bolts to be able to align PG on starter clutch bump and .020-.025" air gap. Mark locations on PG brackets for PG mounting bolts. Remove PG and drill. 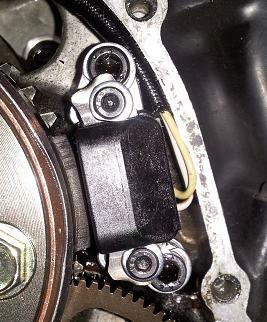 Reposition PG again align with starter clutch bump and air gap. Mark PG mounting block for PG mounting bolts. Remove mounting block and drill & tap holes. Bolt mounting block and PG onto engine. Double check alignment and air gap. Grind PG bracket holes if needed to achieve correct alignment and air gap. Harness connector needs to be changed and wires shortened. 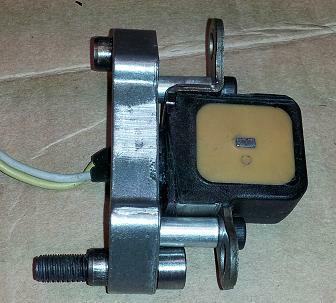 Also need to add in the oil pressure switch wire and connector. 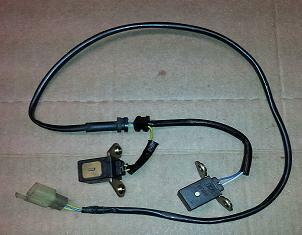 The grommets where the harness passes out of the engine are the correct width but a little too short. I dissembled an original harness and reused the oil pressure switch wire and connector, sleeving, and top grommet where the wires exist the engine. I filled the gap on the lower grommet with some silicon sealer, letting it cure before replacing the engine side cover. The wires inside the engine are longer than the originals. Zip-tie to keep them out of the gears. The challenge with these PG's is the bracket is hardened steel. Grind plastic off sides to make more room for the stands offs. Grind plastic off bottom so it will clear the mounting bracket. Grind off locating collars to make underside of bracket flush. Optional - grind off the original holes. The PG is mounted with 1/2" long stand-offs, diameter for the bolts you use. I had metric taps so went with bolts of the original size - 4mm. #10 (IIRC) stand-off was just the right size for these. Drilling the holes in the brackets presented a bit of a challenge. The brackets are hardened. Ended up using a masonry bit in a drill press. I held the stand-off against the side of the PG to judge how far over to place the hole, and then in-line with the edge of the bevel (see pic at top). However, I would suggest putting them closer to the front face of the PG. One ended up a bit too close a PG mounting block bolt, and then needed to grind down that bolt head (see pic on right). 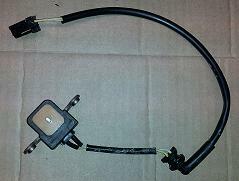 Note there is a limit on far forward you can go, else you will run a foul of the original PG mounting holes. Was hard to accurately drill the holes. A center punch would not make any appreciable divot in the bracket and the bit wandered on starting. Had to really bear down to get the hole started. Splice PG white to harness white and PG yellow to either harness yellow (top PG) or blue (front PG). 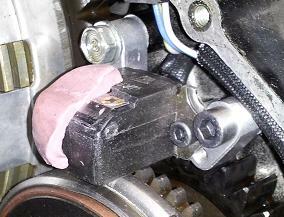 Make sure the wires are clear of the gears - zip-tie if needed.